Here at CES 2015, the connected smart home of the future is extending beyond your four walls and into your garden. Agricultural startup Edyn has just announced its Wi-Fi-enabled Edyn Water Sensor and Water Valve that keeps tabs on soil nutrition and moisture levels and automatically delivers the exact amount of water necessary to eliminate waste. The Bluetooth-enabled Parrot H2O and Pot, meanwhile, perform the same exact job for potted plants. The Edyn Garden Sensor is solar powered, with a rechargeable lithium iron phosphate battery for cloudy days. It constantly measures the ambient temperature, humidity, light intensity and soil electrical conductivity. That information is relayed back to the free Edyn iOS app via the cloud. The app then analyzes your garden’s unique conditions and provides tips for maximizing your plants’ health. The sensor can be purchased as a stand-alone item, but you’ll likely want to pair it to the Edyn Water Valve. 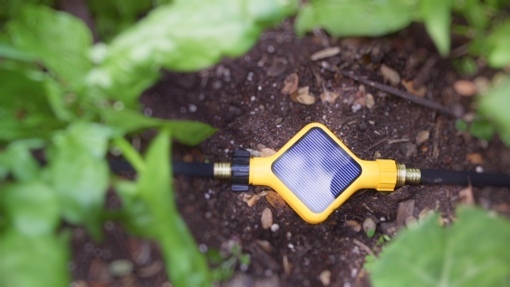 The solar-powered device (again, with a rechargeable battery for backup) easily connects to your garden hose using washing machine fittings. It interfaces with the Edyn Garden Sensor to automatically provide water to your plants only when they need it, saving water and eliminating waste. You can also control the valve manually through the Edyn app. It's compatible with most drip irrigation, soaker hose and garden hose-fed sprinklers. For those of you with potted plants, check out the Flower Power H2O and Pot by French wireless tech company Parrot. The Flower Power H2O is a small autonomous watering device that fits in your existing pots. The more impressive indoor/outdoor Parrot Pot is made of ceramic and holds up to 2.2 liters of water in its reservoir. It has sensors to track soil moisture, fertilizer levels, sunlight and temperature. The companion Parrot mobile app gathers that data and compares it against the optimal conditions for over 8,000 plants. Each provides expert-level care for your plants, even during your extended family vacations. The Edyn Garden Sensor and Water Valve will be available starting in spring 2015 at Home Depot and through edyn.com. The garden sensor will retail for $99.99; the water valve will retail for $59.99. To learn more, visit the company’s website. The Parrot H2O and Pot will be available sometime in 2015. Pricing has yet to be announced. To learn more, watch the short promotional video below or visit the Parrot CES 2015 webpage.